A hug from a loved one. A bowl of rice pudding. A cozy blanket and a cup of tea. Sometimes we have to take comfort wherever we can find it, and today is one of those days. I had a moment over the weekend of realizing all that was happening, all at once. There’s the piddly stuff—our dog’s incessant barking at the raccoon in the tree off the deck. The shirt I spilled chili oil on and can’t get clean. There’s mid-sized stuff: my husband preparing for his second art show. An article I had published last week that has done very well. Our son starting kindergarten. Then there’s big stuff…seven years ago tomorrow I gave birth to my first son, who was stillborn due to a cord accident. Last Saturday we attended a funeral for a good friend’s mom, whose passing means a new world for the many people who loved her. And this morning our hearts stopped for a second when we woke up to news of the mass shooting in Las Vegas. I haven’t felt like working all day—writing recipes and blog posts and whatever else just doesn’t seem very important when I consider the lives touched by the shooting last night. But then I sat for a few minutes in meditation, and noticed a feeling within, a longing to connect. I saw a psychic picture of my sadness reaching right out of my body to pull my loved ones together for a meal. It’s an essential way we connect with each other, sharing a meal. Whether we gather to celebrate or mourn, we often break bread in the course of the proceedings. It’s a simple, quotidian act that is also vital and unifying. Perhaps even more than the nutrition within the food, we are nourished by the presence of one other and our collective understanding of all that is life. I decided to write a recipe for comfort, and this rice pudding is the first thing that came to mind. It’s so good you might want to just have it for dinner and dessert. And who cares if you do? Perhaps the best thing about tragedy is the perspective it lends. Take care of each other and take care of yourself. 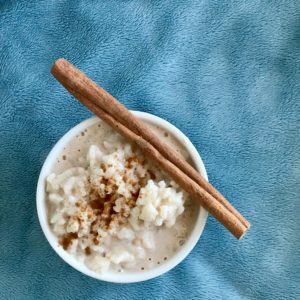 In case you do want a nice dinner that goes with this rice pudding, here are two good options: Vegan picadillo and Taste of autumn yam and kale stew. In a medium saucepan, cook the rice according to the package instructions, substituting coconut water for regular water. When the rice is done cooking, add all of the remaining ingredients and stir well. Let the pudding rest on the stovetop until you’re ready to serve it. Garnish with a dash of cinnamon and/or pistachio pieces or coconut. This recipe tastes best when served warm. If it needs to be reheated, be careful not to scald the coconut milk or it will create a gooey, inedible mess. For an extra treat, serve this coconut rice pudding with fruit, such as mango, peach, plum, or figs.